The Pittsboro Pepper Festival may sound like it belongs on the list of “Top 10 Strangest Small Town Events in America,” but it’s one you don’t want to miss. While the obsession with local heirloom peppers might be a little quirky, this growing celebration of local food, beer, and music is truly a community event. 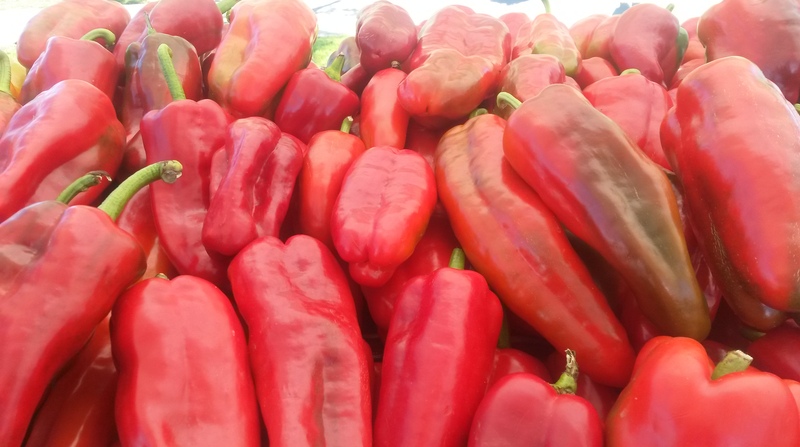 The 4th Annual Pittsboro Pepper Festival is set for Sunday, October 2, from 4 to 7 p.m. at the newly constructed community park in Briar Chapel (north Chatham county off of US 15-501). Local hotshot chefs will present appetizers and desserts featuring over 60 varieties of heirloom local peppers (everything from sweet to hot). You’ll also enjoy peppery beer. It could take you all evening to swallow the spicy samples from this dazzling list of participants from A to Z: Andrea Williams, Angelina’s Kitchen, Bean and Barrel, Benjamin Wineries, Bobby’s Water Ice, Cackalacky Cantina 18, Carolina Brewery Carolina Crossroads Restaurant Chatham Marketplace, Chicken Bridge Bakery, Crook’s Corner, Fullsteam Brewery, Dos Perros Restaurant, 8 Seaboard, Hillsborough BBQ, The Granary at Fearrington, General Store Cafe, Green Man Brewery, Glass Half Full, Lucky 32, Market Restaurant On the Square, Mez , The Natural Chef Program @ CCCC , Top of the Hill Restaurant & Brewery, Triangle Brewery, Saxapahaw General Store, Starrlight Meadery, Stevie’s Booch, Vimala’s Curryblossom Cafe and Zely & Ritz. 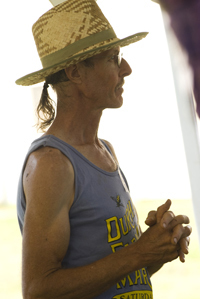 The festival sprung from the work of Doug Jones, farmer extraordinaire of Piedmont Biofarm. 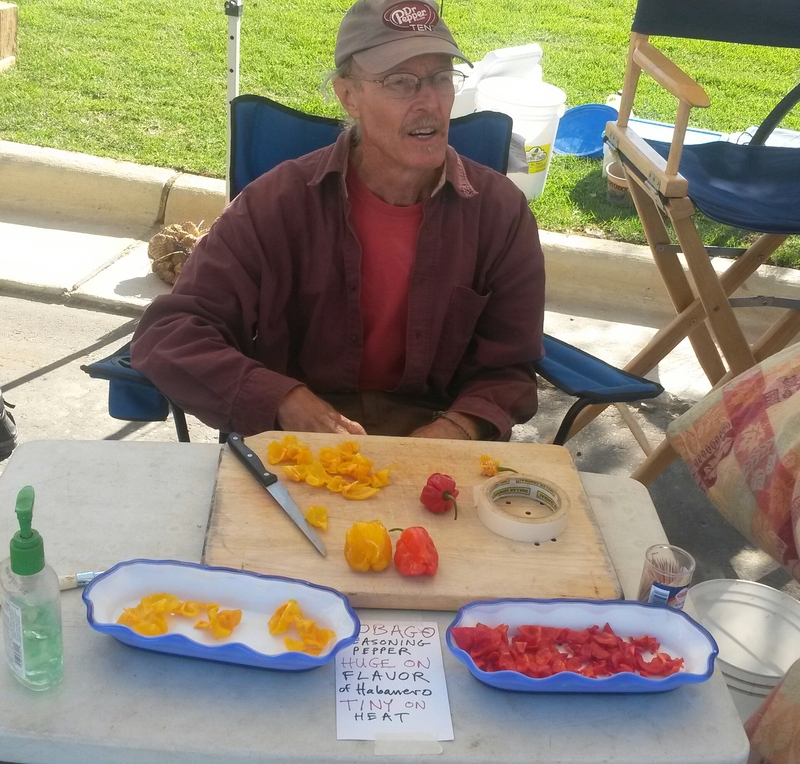 He has been creating and growing special peppers designed to thrive in Pittsboro and the Piedmont. He grows about 100 varieties at his farm on the eastern side of Pittsboro, and he wants you to love peppers as much as he does. There will also be live music by Justin Robinson and the Mary Annettes, and Lonnie Walker. 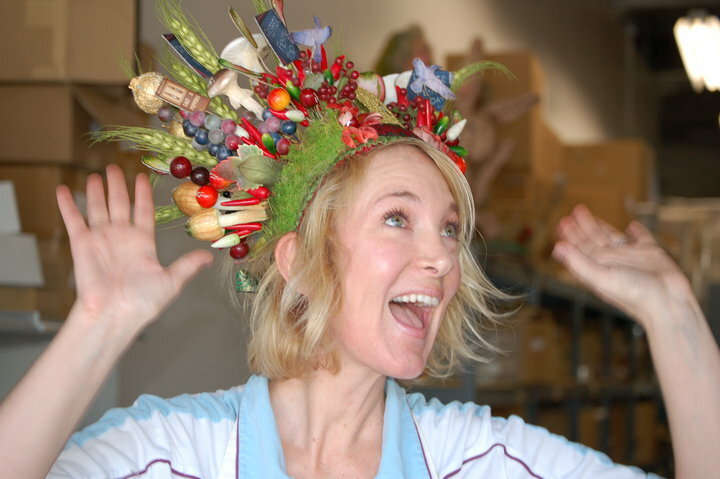 Stick around for the crowning of the King and Queen of the festival. And bring the kids, face-painting and plenty of activities for the whole family. 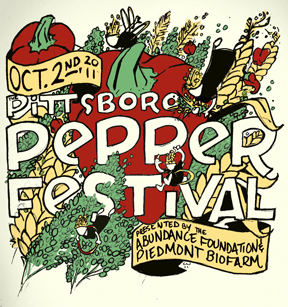 Pittsboro Pepper Fest proceeds go to the Abundance Foundation and Piedmont Biofarm. Admission is $20 in advance until Sep 13, $25 until Oct 1st, or $30 at the entrance and includes all-access to food and entertainment. Beverages are cash bar. As always, the Pittsboro Pepper Festival’s screen-printed Limited Edition 2011 t-shirts and posters will be on sale at the festival. Sponsors include: Briar Chapel, Sanford Construction, WCHL, Sanford Contractors, Top of the Hill Restaurant and Brewery, openNMS, McKim & Creed, Burt’s Bees Corporate Investors Mortgage Group, Piedmont Biofuels, Larry’s Beans, Chatham County Economic Development, Bradshaw & Robinson, LLP, JY Visuals, Shakori Hills Grassroots Festival of Music & Dance, The Sustainable Agriculture Program, Central Carolina Community College , Carolina Farm Stewardship Association, Kinder Soles, Krombach Dunn & Co, PLLC, Garlick and Murray Family Medicine, Weaver Street Realty, Country Farm & Home, Chatham Mills Farmers’ Market, NC Agritourism Networking Association, Lowe’s Home Improvement, Chatham Portables, Eco Products. Here’s a great way to celebrate spring, contribute to a unique community garden, and learn how to grow shitake mushrooms. 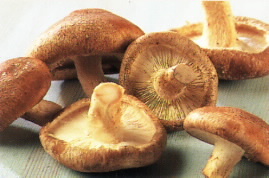 The Carolina Campus Community Garden will have a shitake workshop on Sunday March 20 from 1 to 3 p.m. You can learn how to grow shitakes by helping UNC staff and students prepare 12 logs with mushroom plugs for the garden. Leading the workshop will be Aaron Moody, a geography professor who grows mushrooms on the side. You will also get to sample some delicious dishes made with shitakes. How about some mushrooms with fontina cheese over polenta? The garden was developed last year by Claire Lorch and colleagues to give UNC employees and students access to fresh local food that they can raise themselves and share with others. It’s located on University property on Wilson Street, off of Cameron Avenue just a couple of blocks west of the Carolina Inn in Chapel Hill. The workshop is free, but you are welcome to give a donation to the garden. For more information, contact Claire at clorch@email.unc.edu. 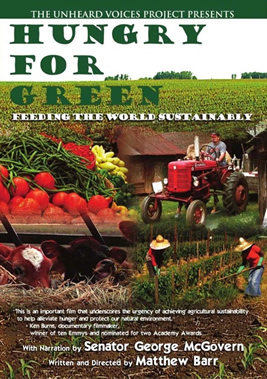 ChathamArts’ Sustainable Cinema series will feature an evening of local documentaries about sustainable agriculture, Tuesday September 28 at 7 pm in the Barn at Fearrington Village, eight miles south of Chapel Hill. North Carolina filmmaker Matthew Barr presents Hungry for Green, one of the first films to link issues of agricultural sustainability and worldwide hunger. The 30-minute documentary, narrated by former U.S. Senator George McGovern, underscores what farmers and consumers can do to influence how food is produced in the U.S. and around the world. Backyard Bounty by Diana Monroe and Martha J. Moore. Bountiful Backyards is laying the groundwork for Two Ton Farm, an urban minifarm cooperative that will produce literally tons of fresh produce for the neighboring community. Green McDonald’s Guy, by Brooke Shuman and Maura Tourian. One of only three “green” McDonald’s restaurants nationwide opened in Cary in 2009. Franchisee Ric Richards describes its surprisingly long list of eco-friendly design features. Watch Me Grow, by April Simon and Sara Washington. The Watch Me Grow program introduces kids as young as three to gardening, to engage their senses and to encourage them to eat more fresh produce. A panel discussion follows with filmmaker Matthew Barr and local sustainable farming advocates. Admission $5 at door. 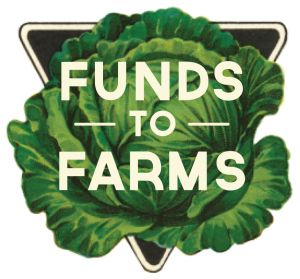 The Abundance Foundation in Pittsboro has launched a Slow Money Project that has already raised $29,500 from local folks and given low-interest loans to two local food enterprises. If you would like to get involved as an investor or borrower, or if you would just like to learn how this works, come to a meeting on Monday July 12 from 7 to 8:30 p.m. at Chatham Mills (420 Hillsboro Street) in Pittsboro. The objective of the Slow Money Project is to match people who wish to invest in improving the resilience of our community by enhancing our local food shed with borrowers who have compelling projects that can accomplish that goal. Light refreshments will be provided, and you are welcome to BYOB from Chatham Markeplace. Please feel free to pass this invitation along to friends, family and anyone else you care about who might benefit from this project; as in anyone who eats food. Let’s start planting our local money in our local food shed.